Hopefully wherever you are in the world, you are staying cool and relaxed this summer! If you are like us, and we think you are, now is the time when seed possibilities for next year are blossoming and growing into actual ideas. In the interest of self preservation and having a life, all the ideas we are growing are bound by one rule: does it take the same amount of energy (or less) but create something better? We would love to share what we are thinking with you, in the hopes that you will share yours with our community, and provide feedback and variations in the vein that many heads are always better than one. Below you will find some of the grumbles of the year in bold, and our thoughts of revision below that. Morning meeting always takes so looooooooong, but I believe in the community building it provides! Kristi tried a morning meeting and an end of day meeting when they revised the daily news, but always ran out of time. This year she is going to try two meetings: morning meeting- conquering some of the necessary (but time eating) routines: greeting each other, counting the days, reviewing the schedule, then segue into shared reading. Then the class will have an afternoon meeting right after lunch, the focus of this meeting will be TALK: whole class conversations about “news”, a chance to work on oral storytelling, and a review of the afternoon schedule. Daily whole class conversations helped Kristi’s class tremendously with language and listening skills, but it was often cut short – an afternoon meeting protects this time, and also allows for some social skills work since much of the news after recess will be drama filled! 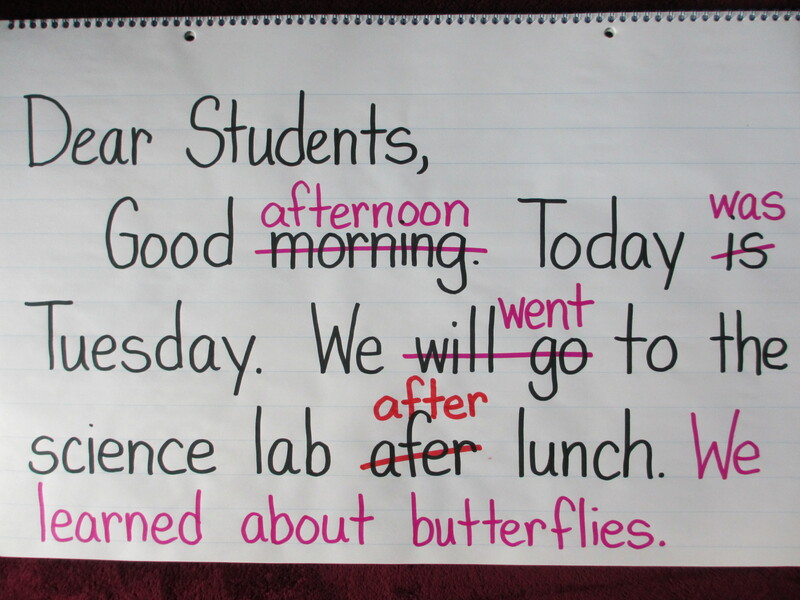 Daily news revised at the end of the day, then edited the next day during shared reading. I love sharing with parents but compiling the letter takes a long time, and gets exhausting! Twitter offers restricted accounts, which means you approve who can join and who can see your tweets. This year I am opening a classroom twitter account for families. It takes two seconds to tweet a photo, and Kristi’s goal is to tweet a daily picture. Less work for her, but more consistent interaction for the parents. A picture is worth a thousand words, so the 140 character limit is a little misleading. 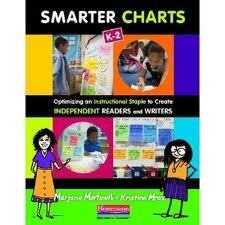 Tentatively, Kristi is also thinking of a monthly twitter chat for families. Topics like: reading at home, helping with spelling, math games…These chats are becoming more and more mainstream, and all a parent needs is a smart phone (which is sometimes more prevalent in homes than a computer). She is also planning on a shared google calendar. She keeps one for herself, why not share it with families? It can have publishing parties, birthdays, trips, and parents visits in a place that everyone has access to. Not only that – it sends alerts! Play with grammar in shared reading: which animals are male and which are female in Mrs. Wishy Washy? The only way you know is by the he or she used in the line “Oh lovely mud” said the _____ and he/she rolled in it. 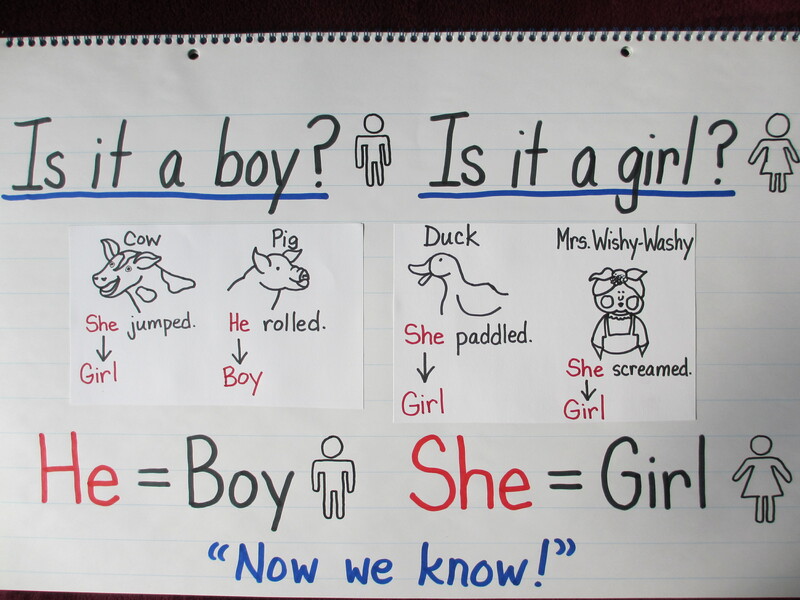 This chart uses some very familiar characters to help remember pronouns. What are you puzzling through this summer? What lightening bolts have struck you? We would love to hear it! You can tell us in the comments, @chartchums (twitter), @MrazKristine (twitter) or chartchums@gmail.com.